The Battle of Elaia–Kalamas (Greek: Μάχη Ελαίας-Καλαμά, Machi Elaias-Kalama) took place in Epirus from 2–8 November 1940. The battle was fought between the Greeks and the Italians during the initial stage of the Greco-Italian War. The Italian Army, deployed on the Greek-Albanian border, launched an offensive against Greece on 28 October 1940. The main thrust of the Italian invasion occurred in the Epirus sector, with a further flanking move through the Pindus mountains. In Epirus, the Greeks held the Elaia–Kalamas river line, and even though the Greek army was outnumbered, the local Greek forces under Major General Charalambos Katsimitros managed to stop the Italian advance. Along with the Italian failure in the Battle of Pindus, these Greek successes signified the complete failure of the Italian invasion, leading to the dismissal of the Italian commander in Albania, Sebastiano Visconti Prasca, on 9 November. In the next few weeks the Greek forces managed to initiate a counter-offensive, which forced the Italians to retreat deep into Albania. After the Italian invasion of Albania in April 1939, the Greek General Staff became alerted to a potential Italian attack from Albanian territory. Faced with the strong likelihood of a concerted Italian-Bulgarian attack against both Epirus and Macedonia-Thrace, the main Greek contingency plan, codenamed "IB" (for "Italy-Bulgaria"), essentially prescribed a defensive stance in Epirus. Two versions of the plan existed: the first suggested forward defence on the border line, while the second dictated initial defense in an intermediate position prior to a gradual retreat to the Arachthos River–Metsovo–Aliakmon River–Mt. Vermio line, leaving most of Epirus in Italian hands. It was left to the judgment of the local commander of the 8th Infantry Division, based in Ioannina, Charalambos Katsimitros, to choose which plan to follow. A significant factor in Greek favor was that they had managed to obtain intelligence about the approximate date of the attack, and had just completed a limited mobilization in the areas facing the expected Italian plans. Greek soldier sitting on a captured Italian L3/35 tankette. The Greek High Command in the first days of the conflict was pessimistic about the ability of the Greek Army to repulse an Italian attack, against a position which was difficult to defend. The defensive line near the Greek-Albanian border could only be thinly manned, before the general mobilization and concentration could be completed and thus was expected to fight the enemy forces only in order to delay their advance. The commander of the only Greek division (8th Infantry Division) covering that part of the border, Major General Charalambos Katsimitros, realised the strategic value of the area, in which the Italian superiority in men and armour had limited value because of the mountainous and marshy terrain. Contrary to the directives from the High Command under Lieutenant General Alexander Papagos, he concentrated the main forces of his division there, with the intention to give an all-out battle in that position. Papagos had reluctantly approved Katsimitros's plan, after sending Colonel Drakos as a new chief of staff in the division, who after careful study of the area, also agreed with the plan. The Italian forces initiated their offensive on the morning of 28 October. The Italian Ciamuria Corps, spearheaded by the 51st Infantry Division Siena and 23rd Infantry Division Ferrara (Ferrara Division) and the 131st Armoured Division Centauro, attacked toward Kalpaki (Elaia), while on its right it was supported by a small brigade-sized Littoral Group of ca. 5,000 men. According to the plans the Greek screening units started a slow retreat toward the main defensive line of Elaia-Kalamas, about 30 km (19 mi) southward of the Greek-Albanian border, north of Ioannina. On the 2 November, the Greek forces were positioned according to the defensive plan in the line: Kalamas–Elaia–Grabala–Kleftis hill. On this day, after repeated air and artillery strikes, the Italian infantry of the Ferrara Division attacked unsuccessfully in order to advance the bulk of their forces closer to Elaia sector. The Italians faced difficulties because of the harshness of the terrain. The next day, their light L3/35 tankettes and medium M13/40 tanks were unable to cope with the hilly terrain and the muddy ground. The Greek defensive line could not be breached. On its right, the Littoral Group managed a slow advance along the coast and was able to secure a bridgehead over the Kalamas River on the 5 November. The winter weather, poor leadership and minefields, caused the Italians many casualties. On the 8 November, the fruitless Italian offensive was suspended. Because of the complete failure of the Italian operations, commander Sebastiano Visconti Prasca was relieved of his command after only two weeks and replaced with General Ubaldo Soddu. After the successful Greek defense in Elea-Kalamas and in the mountains of Pindus, the Greek forces were able to push back the Italians, advancing into southern Albania. 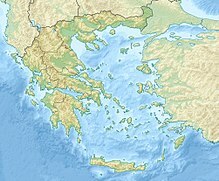 Before the German intervention in April 1941, the Greeks penetrated 30–80 kilometres (19–50 mi) into Albanian territory. ^ a b AHD 1960, p. 49. ^ AHD 1960, p. 114. ^ a b c Koliopoulos & Veremis 2009, p. 107. ^ Sakellariou 1997, p. 389. ^ a b c Gedeon 1997. ^ Willingham 2005, p. 28. ^ Mitcham 2007, p. 114. Gedeon, Dimitrios (1997). An abridged history of the Greek-Italian and Greek-German war, 1940–1941: (land operations). Athens: Hellenic Army General Staff, Army History Directorate. ISBN 978-960-7897-01-5. Katsimētros, Charalampus (2007). Ē Ēpeiros promachusa : ē drasē tēs VIII merarchias kata ton polemo 1940–41. Bibliothēkē Ēpeirōtikēs Hetaireias Athēnōn (in Greek). Athens: Ēpeirōtikē Etaireia. ISBN 960-89690-0-X. Koliopoulos, Giannēs; Veremis, Thanos M. (2009). Modern Greece: A History Since 1821. Wiley-Blackwell. ISBN 978-1-4051-8681-0. Mitcham, Samuel W. (2007). Eagles of the Third Reich: Men of the Luftwaffe in World War II. Mechanicsburg, PA: Stackpole Books. ISBN 978-0-8117-3405-9. Sakellariou, M. V. (1997). Epirus, 4,000 years of Greek History and Civilization. Athens: Ekdotikē Athēnōn. ISBN 978-960-213-371-2. Η Ιταλική Εισβολή [The Italian Invasion]. Athens: Army History Directorate. 1960. Willingham, Matthew (2005). Perilous Commitments: the Battle for Greece and Crete: 1940–1941. Staplehurst UK: Spellmount. ISBN 978-1-86227-236-1.